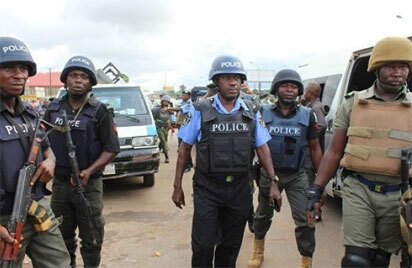 Operatives of the Lagos State Police Command under the Mushin Area Command led by the Area Commander, Assistant Commissioner of Police, ACP Olasoji Olabayo on Sunday swooped on a Jet A1 siphoning and smuggling ring who had been stealing the products for months and selling it as kerosene to unsuspecting members of the public. The Jet A1 aviation fuel smuggling ring was smashed at a bush site in the Richfield area of Ajao Estate allong the Murtala Mohammed International Airport following the busting of a very thick iron pipe supplying the fuel to the international airport depot. ACP Olusoji, who Vanguard reports mobilized four patrol vans and well-armed team of police officers drawn from the Area Command headquarters and Ajao divisional Police Station, was accompanied by the DPO, CSP Adejoh Abdul. After the siege on the smuggling site and combing of the bush where the smuggled fuel were being hidden, 5 suspects, including three women and two men were arrested while Jerry cans of various sizes loaded with the product were recovered. ACP Olasoji later ordered that the suspects be detained at the Ajao Estate Police Station while directing that efforts should be made to arrest other colluding members of the smuggling ring. He noted that apart from the fact that smuggling of the product is economic sabotage; the criminal activity of selling aviation fuel to unsuspecting members of the public was even more risky as nobody could determine the dangerous implication of using aviation fuel for cooking. Also speaking, CSP Adejoh said information about the nefarious activities of the gang got the police a few days ago after which surveillance was mounted on the site leading to the breakthrough in the arrest.